and 'snaps' those fingers to..
grooving to the dope beat made by..
Local Apple Mac expert ‘Apple Allen’ will come to you. Whatever you need; a repair, an upgrade, advice, support, training or just ‘help’. 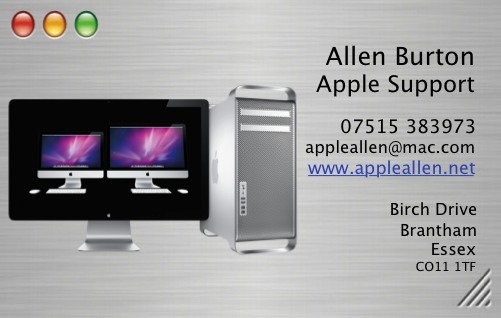 It may sound like a boast but Allen has never failed to resolve an Apple problem. You will have individual attention and guidance, even training. Whether you are new to Mac or trying to master the latest pro software. "I tell everyone about Apple Allen. That is how happy I have been with his services. He is always there to help, especially when he can tell I’ve hit a crisis point. He sorts everything first time, meaning my downtime is minimised. I am grateful for having found his services."